Just Planet is part of a global movement to uphold human dignity and advance human rights for all. Our global network of human rights advocates allows us to collaborate with a broad range of experts and activists. We believe standing together as a global human rights movement is essential to advancing the nature and realization of human rights. Engaging the perspectives of legal experts, victims/survivors, civil society groups, academics, journalists, local practitioners, and other international human rights actors, Just Planet develops a thorough understanding of human rights issues. We recognize a particular responsibility to victims and witnesses who share their experiences and stories with us. Our team makes representations and submissions to international human rights monitoring bodies regarding States’ failures to implement or comply with international human rights treaties, standards, and norms. Through training seminars, educational videos, and resource materials, we aim to provide civil society groups and individuals with an increased knowledge of human rights standards and an expanded network of advocacy, research, and education. We profile emerging and pressing human rights issues through academic research, publishing, policy documents, expert seminars, international meetings, public speaking, and media communications. Climate change poses a grave threat to humanity. Those who are most vulnerable to the impacts of climate change are those who have contributed the least to its causes--people in poverty, women and children, indigenous peoples, people of the Arctic and global south. In regions already threatened by conflict, insecurity, and poverty, climate change acts as a 'threat multiplier', exacerbating inequalities and struggles for resources such as water and food. Just Planet recognizes that the full realization of human rights requires protection of the environment. Our advocates push human rights monitors, experts and advocates to claim environmental and inter-generational dimensions of human rights, highlighting States' obligations to protect against climate change. The 2030 sustainable development agenda was adopted by the United Nations General Assembly in September 2015. The agenda shows limited alignment with international human rights standards. And it is build on a weak accountability framework. 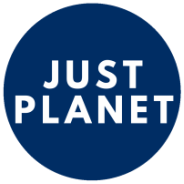 Just Planet promotes the integration of human rights into the development agenda through research and analysis, support to human rights mechanisms and engagement with follow up and review mechanisms.